INTRODUCING MAT|R AT STALLMAN’S EVENT AT ÁNGEL BUSTELO AUDITORIUM IN MENDOZA. Last Thursday May 24th, we introduced our applications development platform called mat|r within the framework of Richard Stallman’s conference, ‘Free Software in Ethics and in Practice.’ This platform includes high-level, extensible and efficient language that has been optimized to model digital experiences. Claudio Marrero, mat|r Chief Evangelist, gave a talk in front of more than one thousand five hundred people about mat|r. He spoke about how our collaborative applications development ecosystem aims to be a Free Software project with the goal of creating a developers’ community in continuous feedback. 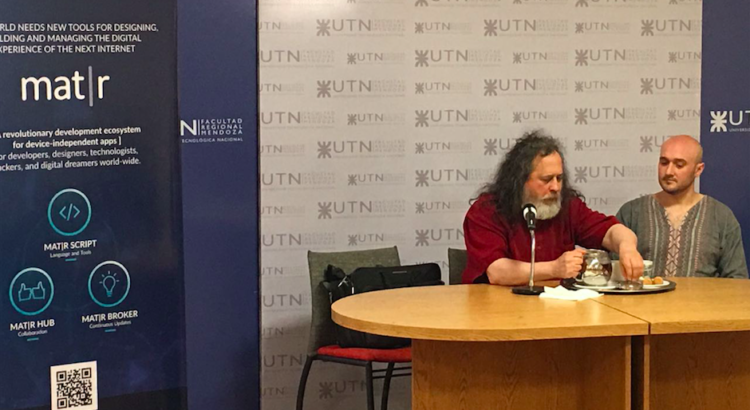 The conference agenda was full of activities related to Stallman: a round table discussion at the National Technological University (UTN), press conferences, and a more private dinner with the presence of Mr. Stallman himself, the UTN’s directorial team and the mat|r team. ‘We know it is fundamental to democratize the power of creating digital experiences.’ Claudio Marrero, Chief Evangelist. At the conference, Claudio Marrero emphasized mat|r’s most important points by highlighting the needs that the platform fulfils. Today, the way users experience the physical and digital world is constantly changing due to the presence of a great variety of interconnected devices: phones, fridges, microwaves, and, even, washing machines. For this reason, the demand for speeding up the decision, learning and intelligence transformation in the digital experience arises. Mat|r intends providing a solution to the matters mentioned before. As a result, it offers a language of its own and it turns into a development tool designed to model dynamic experiences in evolution. Mat|r is a new way of developing applications that combines a small number of code lines, collaboration and reuse in a user-friendly environment. This allows creating applications in a shorter period of time than it would normally take by using traditional language. Mat|r script allows applications to update themselves from the application model. The status of our product is Beta. So, we are working to launch its components separately as open and code free projects. Mat|r project is a free software private project which was created by developers based in Mendoza as well as by other team members from different cities across Argentina and its surroundings. We want the platform is available to be downloaded, modified and distributed freely. For this reason, we invite you to visit platform.matrproject.com and join the community. Access the platform and create an account with this access code: RMSMA518. Mat|r paid tribute to the founder of the Free Software Movement, Mr. Stallman, with Argentine barbecue and a tango performance as a show of gratitude for his presence. Having Richard Stallman in Mendoza represents an enormous privilege as he encourages and promotes the idea of software as something that is free to use, modify, distribute and study. If you want to check the full conference, we will upload the video to matrproject.com/Stallman this week. Don’t miss it. For more information, please contact us at support@matrproject.com.